Inquire For Specials, Gorgeous Huge House, Private Pool, Game Room, Free Resort Amenities! The Champions Gate Resort is the place for your next vacation! We would love for you to stay in our beautiful 9 bedroom / 5 bathroom home. This gorgeous home has enough bedding for 19 people! Plenty of room for the whole family. Each bedroom has a TV and the home includes WIFI throughout and has a laundry room with a full sized washer and dryer. Stock the fridge at nearby Publix supermarket and enjoy a few family meals in. The gourmet kitchen has everything you need to prepare your own meals and save money while vacationing. 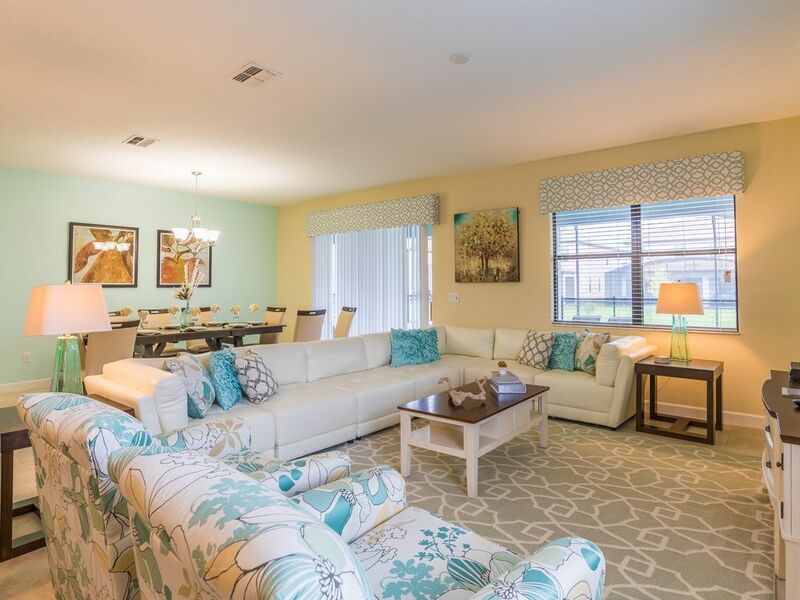 You will love the decor and furnishings in our home. We have thought of everything to enhance your stay. Enjoy our screened in patio with west facing pool and spa. We have plenty of seating around two different patio tables to enjoy a meal poolside in the Florida sunshine! Ready for fun? Head to the game room and challenge your family to a game of pool or air hockey. Great spot for the family to hangout! The Champions Gate Resort is amazing with 3 separate pool areas including a lazy river and waterslide, kids splash park and large quiet pool. The restaurant serves lunch and dinner and offers food and beverage service directly to your deck chair. The kids will the love the movie theater and arcade room and you can even drop off the younger ones at the activity center (for a fee) to enjoy some adult time. The fitness center is brand new with everything you need for a great workout and there is a cardio room offering classes. Theme parks? Nearby! The resort is minutes from Walt Disney World and within easy access of I-4 which leads to all of Orlando's other attractions. What are you waiting for? This is the perfect location for your family to enjoy their vacation! Email / call today for special rates. We look forward to welcoming you to our paradise! Global Resort Homes is located in beautiful Orlando Florida and is the most trusted and reputable Orlando vacation home management companies serving Central Florida. We pride ourselves in offering the hiighest standard vacation home rentals and unparalleled customer service. Our properties are a short drive to DisneyWorld, SeaWorld, Universal Studios, the Orlando Convention Center and local area attractions. We offer 24 hour guest services to handle any needs one might experience while enjoying one of our beautiful properties. Enjoy the peace of mind knowing we are always here to assist whenever you need us. Our goal at Global is for our guests to receive outstanding service while vacationing in luxuriously furnished homes in beautiful resort communities. The Champions Gate Resort is amazing with 3 separate pool areas including a lazy river and water slide, kids splash park and large quiet pool. The restaurant serves lunch and dinner and offers food and beverage service directly to your deck chair.The kids will love the movie theater and arcade room and you can even drop off the younger ones at the activity center (for a fee) to enjoy some adult time. The fitness center is brand new with everything you need for a great workout plus a cardio room offering classes.Think "cruise ship" when you think of this resort. You will all enjoy daily resort activities which include poolside bingo, trivia, sand volleyball tournaments and dive-in movies at the pool. Be sure to inquire with additional amenity questions. If your reservation is booked within two weeks of your arrival date, we do not offer an after-hours check-in for last minute reservations. If you do not check in at our office, you will be unable to check-in to your vacation home and a refund will not be provided. We require you to check in at the Global Resort Homes office by 6 pm Mon - Sat or by 5 pm on Sunday. We will ask to see your valid driver's license and the credit card you used to pay for your reservation. Champions Gate Resort is located close to Disney World along with all of Orlando's attractions.